I'm always hesitant to walk into a film that is willing to unabashedly push an obvious message on its viewers; one that is clearly being used to promote a specific or biased opinion, basically propaganda, and unfortunately that has been the case with many a "Christian-themed" films over the past few years. Message movies are a difficult thing to pull off in the first place because they can indeed seem obvious or come off as overly-hokey or sentimental that, when all rolled into one, are the kinds of movies you typically find on something like the Hallmark channel. When it comes to faith-based films specifically I have a tendency to shy away from them because I've always been of the mind that each person is entitled to believe what they want to believe and though I certainly support learning as much about religious culture and the numerous incarnations of faith that cover our world it has to be of that persons own accord. The individual has to want it otherwise forcing someone into a situation further than an introduction will always make a future decision to believe, get baptized, pray, put trust in a higher power, etc. to be nothing if not insincere. That probably seems a little harsh, but faith is such a personal thing that I have to believe someone has to come to really believe in a God on their own and not be coaxed into it by others. This isn't an essay about religion and faith though, but a review of the latest in a string of faith-based films that have opened in the early months of 2014 to strong reception from an audience that has not necessarily been ignored, but never addressed as outright as they have been lately. It is hard to consider myself part of a group because I like to stay open to different ideas and different interpretations from all points of view, but I do believe in God (even if that belief sways more toward metaphorical than literal interpretations when it comes to the Bible and could apply to the concept of heaven as well) and though I enjoy a good religious debate or interesting conversation about the reaches of space, other life and how it correlates to the existence of a God or creationism vs. evolution, I've still been rooting for a film that comes to the forefront of these faith-based pieces of entertainment and doesn't try to push an agenda on an audience, but simply tell them a story from the point of view of honest believers and I think Heaven is for Real is the closest we're likely get. Todd Burpo (Greg Kinnear) reads his son Colton (Connor Corum) a bed time story. 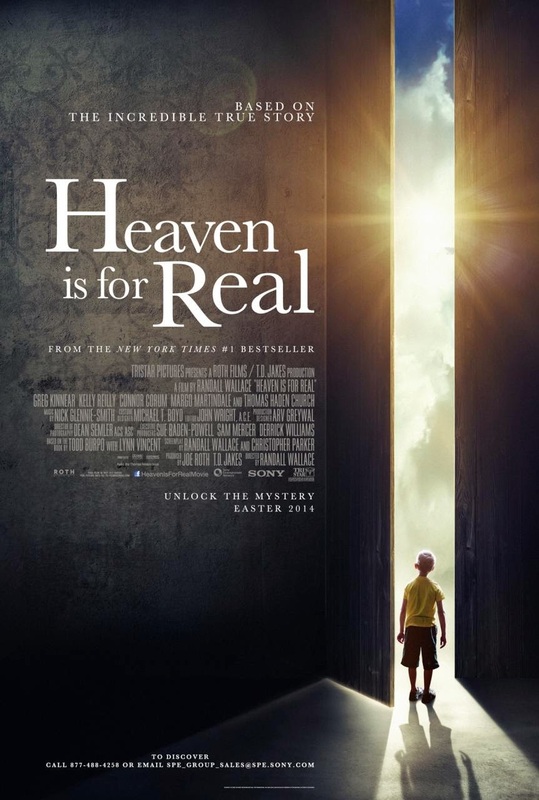 Based on the 2010 New York Times best-seller, Heaven is for Real: A Little Boy's Astounding Story of His Trip to Heaven and Back, written by Todd Burpo and Lynn Vincent the book documents the report of a near-death experience by Burpo's then-four-year-old son, Colton. The book tells of how Colton began saying he visited heaven and re-counting things of which he could have no previous knowledge including the fact he had a sister who died in his mothers womb and where his mother and father were at and what they were doing during his surgery. I have not read Burpo's book and so I had no idea of where the point of view was coming from or more importantly, the circumstances of the situation. It is easy to conjure up an idea with such a definitive title, yet Heaven is for Real is at least intent on exploring its options and coming at the idea of a boys seemingly outlandish claims to create the real reactions that this boy and his family would receive from those close to them and the detractors of their stories. Where most of these faith-based films seem to be relegated to micro-budgets and inexperienced actors you apparently get a little more when your source material has sold millions of copies. Our inside into the story, into the small town feel and to the Burpo family is their patriarch Todd as played by Greg Kinnear. His wife Sonja is not merely an archetype either, but a strong driving presence in this mans every day life and that is no doubt made evident by the tremendous talent and credibility that Kelly Reilly (Sherlock Holmes, Flight) brings to the role. As we meet the Burpo's and their two children, Colton (Connor Corum) and Cassie (Lane Styles), we get to know the average midwest lifestyle they lead and the same struggles they share with everyone. Todd is a preacher, a volunteer fireman and wrestling coach while Sonja stays home with the kids and helps her husband run his church. They are spiritual yet they are clearly not bible thumpers who believe they are holier than thou and who expect everyone in their company to be as well. The Burpo's are real human beings with struggles, questions and faith-testing experiences that give way to both the events the reason for the book and film exist as well as more questions and concerns not necessarily about whether there is life after death, but what the significance of needing something to believe in really means. While I was surprised that a film such as this, one with a very specific audience and a very strategic release date, had been able to garner such a talented cast it also spoke well for the film that director Randall Wallace had signed on as he'd most recently made the inspirational and better than expected Secretariat (his other directing credits include We Were Soldiers and The Man in the Iron Mask). I assumed I knew what I was getting myself into with this one, but with the credentials stcking up I was given hope I might be pleasantly surprised. Let's just be honest up front though and say that Heaven is for Real is not a great film, it isn't particularly moving and for all its softly mixed music, nicely framed shots of rich farmland and well-intentioned performances there is no real drive to the narrative, nothing that escalates the level of impact of what is being claimed to a level where we truly feel moved. Yes, Kinnear is solid as Burpo and his arc is obviously going to be the most interesting here as he deals with the obvious stigmas that will be slapped on him while struggling with whether or not what he preaches to his congregation every Sunday is something he can actually buy into when his son presents him with a reality where those stories from his good book seem to have some basis of fact. It is an interesting dilemma and the film does right not to preach to its audience about how Gods love is real and to not accept it means to turn your back or whatever type of moral code they might have found necessary to get across or implement from Todd's struggles. Instead of drawing any lines and putting themselves in a defining stance on any hot button issues though the film simply offers the gospel of love and if anything it should be admired for daring to say, you know what? I know you may think my story is a crock of bull and I may not agree with what you think is acceptable, but there is no reason to waste time arguing about it, but rather just allow the always complex emotion of love to be seen and spread in its simplest form. No, I don't necessarily think the film was anything special or that it transcended the lines between faith-based films and popular culture, but it stayed true to its values while allowing an overall message that is hard to argue with sum up the themes and conflicts the story is dealing with. It isn't exceptional, but it has real purpose and while I may not admire it from an artistic standpoint I can certainly appreciate it for why it exists. That and I'm always pleased to see Thomas Haden Church and Margot Martindale in a film with juicy supporting roles. Connor reveals a bit of information to his mom, Sonja (Kelly Reilly), that takes her by surprise. The reason it exists is sure to be another reason for those who will be the main detractors of the film to point out why this is even bigger propaganda than any of the other religious films this year. This is a movie based on a book that came from a family struggling with medical bills and the mouth of a preachers son who could very easily have been influenced or simply made-up a version of his dreams that were clearly dictated by what surrounds his life. It is easy to paint a target on these peoples backs and though I don't know where their hearts or their minds fall I'd like to assume that the main message of the film (and what I take is also the books) mirrors that of the philosophy of the people behind it. We don't know what comes after death, no one knows for sure and that is what makes the ongoing conversation of faith and God and those who choose not to believe all the more interesting. Not all Christians hate those who don't think the same as they do and not all atheists are snobby intellectuals who think themselves superior, but for some reason it still seems impossible for people who lead similar lifestyles in terms of what is important to them in this life and what brings our existence fulfillment to get along and simply accept one another for what they are without a level of animosity involved. It is childish on all accounts and whether you believe in the Christian God, Buddah, a host of Gods or nothing at all the film before us simply wants to ask the age old question of why can't we all just get along? There are millions upon billions of intelligent, sarcastic, thought provoking answers that could be fired back at that question, but when it comes down to it, I mean really people, what is the point? I don't mean to do what I'm happy this movie didn't do to me and that is preach a point of view and shove it down my throat, but I truly admire the film, no matter how hokey some of the scenes with Colton and his experiences in heaven are, for not necessarily taking a stand or trying to push an agenda, but simply reassuring those willing to sit and watch that if you need to believe in the existence of a higher power to feel comforted so be it and if not, well that's fine too. Whether heaven is actually for real will always be up for debate, but the film that takes this title likes to believe we all have a form of heaven we can experience in this life and it paints a picture a fair amount of people in this world can relate to. More power to it, less hate for it and no judgement from it.